Thousand Pillar temple is in Warangal district of Telangana. The architecture of the temple illustrates the Kakatiyan culture of the 12th century. 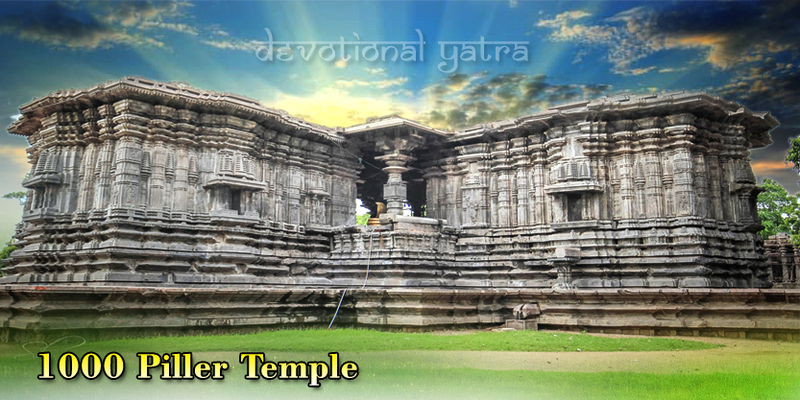 The temple is in exactly located in Warangal – Hanumkonda highway. It is 150 kilometres away from Hyderabad city. Warangal Thousand Pillar Temple was built in the year 1163 AD by King Rudrama Devi. Warangal Thousand pillar temple is the main attraction of Hanumakonda, its shape looks like a star. There are three shrines present that are dedicated to Lord Shiva, Vishnu and Surya. Thousand pillar temple is on a 1-meter high platform on the slopes of Hanumakonda hill. It has a great monolithic statue of Nandi. Nandi is the form of black basalt with a polish finishing. There are many small shrines of lingams around the garden. The temple is popular for its splendidly carve pillars, detailing sculptures and screens. The three shrines inside the temple, collectively named as Trikuntalayam. It is the capital of Andhra Pradesh in the 11th and 12th century. It was a beautiful city with scintillating lakes, spectacular wildlife and beautiful temples. Kakatiyas ruler it for more than 200 years, with the beautiful architecture carvings by them. Warangal Thousand pillar temple is the most popular temple that was built by king Rudra Dev in 1163 AD. All the pillar are beautifully carving with represents the Chalukyan architecture. This thousand pillar dedicates to three lords Shiva, Vishnu and Surya. The huge statue of Nandi is at the entrance. Beautifully carving rock elephants is at the entrance on either side of the Warangal temple. Thousand pillar temple Warangal is a great example representing Kakatiyan architecture. Splendidly cravings on pillars, amazing icons, rock-cut elephants and perforates screens all together are worth watching. October to March is the best time to visit the thousand pillar temple. Bhadra Kali temple is on a hilltop that is famous for its stone image of Goddess Kali. It is between the Warangal and Hanamkonda. The famous Jain temple dedicated to Mahaveer is located here in Kolanupaka. It was built 2,000 years ago with beautiful images of Thirthankaras. The fifth tallest image of Mahaveer is complete with Jade. It is 80 km away from the Hyderabad. Kolanupaka was the second capital of Kalyani Chalukyas during the 11th century. Sri Veeranarayana Temple is built around 1104 AD represents the Chalukyan style. Lake Pakhal was built in 1213 AD by King Ganapathidev. It was built by Channelizing River Krishna’s small tributary. It is 30 sq-km wide that is 50 km away from Warangal. Hyderabad airport is the nearest airport. It takes 3 hrs from Hyderabad to reach Thousand pillar temple in Warangal. Warangal railway station which connects well with all the major cities of India. Transport Corporation of Telangana government is operating buses for Warangal to all its neighbouring cities. You can also go to your private transport.